Cork is an affordable and environmentally-friendly choice for floors and bulletin boards in offices and kids rooms. Cork floors provide a cushioned surface known to resist water and dents. Some people prefer to paint cork floors to brighten the naturally brown appearance, while others choose to paint a cork bulletin board in their kid's room for a home craft project. Painting cork not only changes the color and style, but also prolongs its durability. Learn how to properly paint cork. Remove furniture from the work area. If you are painting corkboard on the wall, place drop cloths on the floors below for protection against paint sprinkles. Sand the cork by hand using a folded sheet of 220-grit sand paper. Use an electric sander for sanding large areas. Remove sanding dust with a tack cloth or a damp rag. Dump paint sealer into an empty five gallon bucket. Thoroughly stir the sealer with a stir stick. Oil based sealer, or shellac, works best for sealing cork wood, but you can also use a latex primer. Dip a 3/4-inch paint roller into the bucket of sealer. The thicker nap on a 3/4-inch roller works best for textured cork surfaces. Roll the sealer over the cork, while applying pressure, to push the sealer into the holes and crevices. Allow the sealer to completely dry. Fill another empty bucket with latex paint. If you are painting cork floor tiles, it is recommended you buy quality floor paint for maximum durability. 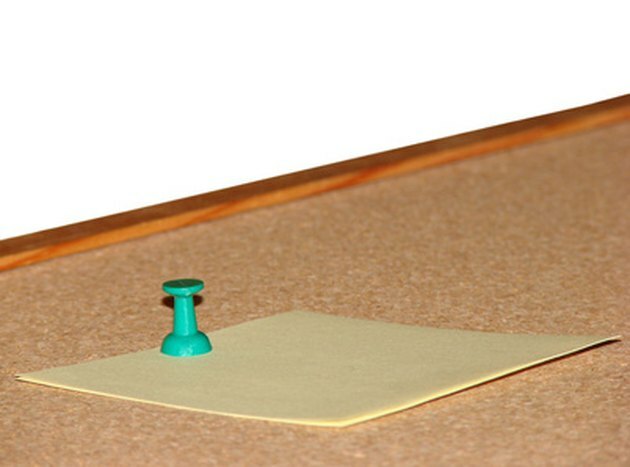 Use latex wall paint for painting a corkboard on the wall. Stir the paint thoroughly before application. Dunk a clean 3/4-inch paint roller into the paint bucket. Apply the paint until achieving a uniform surface over the cork. Allow the paint to completely dry before applying a second coat. Matt Goetz began writing in 2007 with work appearing on various websites. He is a professional painter who owns and operates a residential painting business, and also has experience in home remodeling. Goetz obtained an associate degree from the Joint Apprenticeship Training Committee trade school in Berkley, Ill.